On Sunday, the Chatham Anglers (6-3-2) will take on the Cotuit Kettleers (6-5) for the first time this season with a doubleheader at Veterans Field. Game one will begin at 5 p.m., while game two is set to start around 7 p.m.
Sunday’s matchup will feature two of the three highest-scoring teams in the Cape League. Both the Anglers and Kettleers have scored 56 runs this summer, just two runs behind league-leading Wareham. The A’s lead the league in home runs (10), with the Kettleers sitting in second (eight). Peyton Burdick (Wright State) leads Cotuit in home runs (three), all of which he hit on opening day against Brewster, and RBIs (eight). Since opening day, Burdick has just two hits and one RBI, and his batting average has dropped to a .194 clip. Jonathan Robertson (Creighton) has been the Kettleers’ best hitter with 14 hits and a .341 batting average. Chatham’s Spencer Torkelson (Arizona State) will play Sunday before departing for Team USA on Monday. The rising sophomore has been instrumental in the A’s success so far this season, bashing a league-leading four home runs and 13 RBI. While Torkelson headlines the Anglers’ lineup, John Rave (Illinois State) and Tristin English (Georgia Tech) have been steady contributors. Rave and English rank first and second on the team in batting average, respectively. Chatham’s Spencer Van Scoyoc (Arizona State) will make his first start of the season in game one. In two relief appearances this summer, the left-hander has allowed two runs and two hits in three innings of work. Alek Manoah has a 1.00 ERA in 11 innings of work this summer. Alek Manoah (West Virginia), who has pitched more innings (nine) than any other Anglers pitcher this season, is scheduled to start game two. 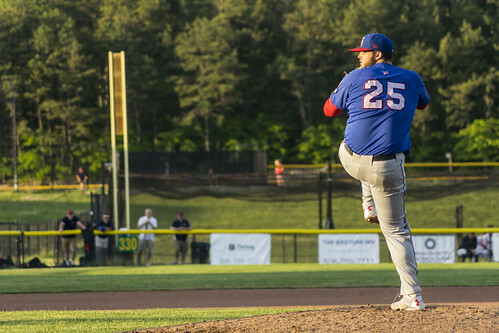 After surrendering three runs in the A’s opening day loss to Wareham, Manoah was in control against Bourne on June 17, striking out eight batters while allowing one run on two hits. John Baker (Ball State), Cotuit’s game one starter, boasts a 1.64 ERA this summer. The right-hander has allowed just two runs in two starts of five innings or more. After Saturday’s rain postponed four of five scheduled Cape League games — including Chatham’s matchup with Falmouth and Cotuit’s contest with Orleans — both teams will need to be rejuvenated after the off day. Neither team won their first game after a day of rest earlier this season. A’s manager Tom Holliday said he thought his team lacked energy in their first game back after an off day, a 6-3 loss to Wareham on June 19.